It is a dark time for your company. Your recent multi-gazillion dollar project to build and deploy an orbiting Battle Station has gone awry. On its maiden voyage a shabby group of troublemakers managed to blow it up with a lucky shot to an exhaust port. Of all places! The story has it that he even took the shot with his eyes closed! To say that morale is low at your company is an understatement. Everyone dresses in black and gray now, is afraid to gather around the water cooler and co-workers are getting choked out by your boss left and right. Last week your asthmatic boss called you into his cubicle and assigned you to a new task: build a new Battle Station to defeat this band of motley rabble-rousers. But this time, do it right. On time, on budget and with no exposed exhaust ports! Or else! Your primary goals are to construct the Battle Station and live longer than your predecessor. You decide to manage your project "in the cloud" with Salesforce. This way everyone on your team can collaborate, be successful and stay alive. The last thing you want is to receive an email from your boss with the subject, "You have failed me for the last time." In this project, you will learn how to build an application on the Salesforce Platform from start to finish, without writing any code. If you're new to the Salesforce Platform, the goal is to introduce you to the basics of app building. It's fun, easy and won't leave you short of breath. You need a free Trailhead Playground or Developer Edition org to complete this project. You can find it at the bottom of this page. Click Launch to open the Trailhead Playground in a new browser tab (login required). Create the app and a data model for the application. This simple application requires only a few custom objects with a small number of fields. Implement business logic using formulas, validation rules and a process builder. Build reports and dashboards to track the status of supplies and analyze how well the company manages resources. Let's get started. This app isn't going to build itself! If you haven't already, log in to Trailhead, then launch your Trailhead Playground by clicking Launch at the bottom of this page. 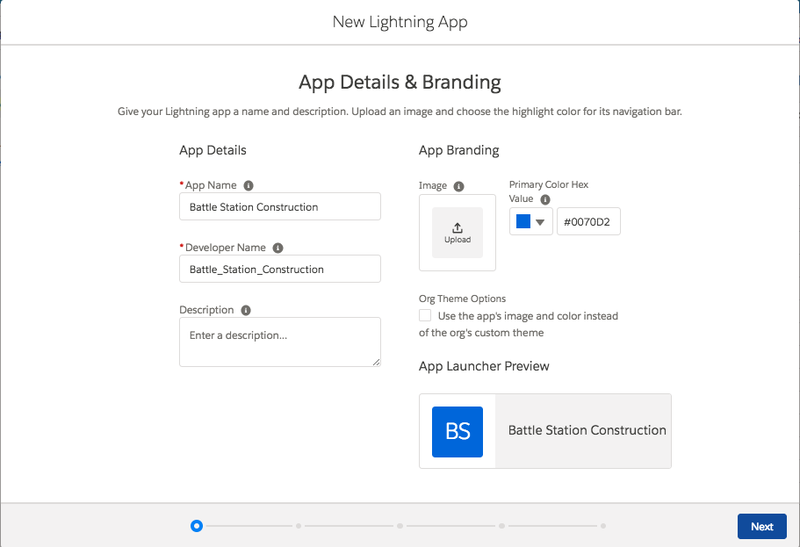 Make sure you switch to Lightning Experience to complete this project. If you haven't yet enabled Lightning Experience, do that now. Before we move further with creating an app, let’s create an object Battle Station. Click on Create dropdown at the right side and then select Custom Object. For Object, select Battle Station. Now we need to enable Feed Tracking for the Battle Station object. 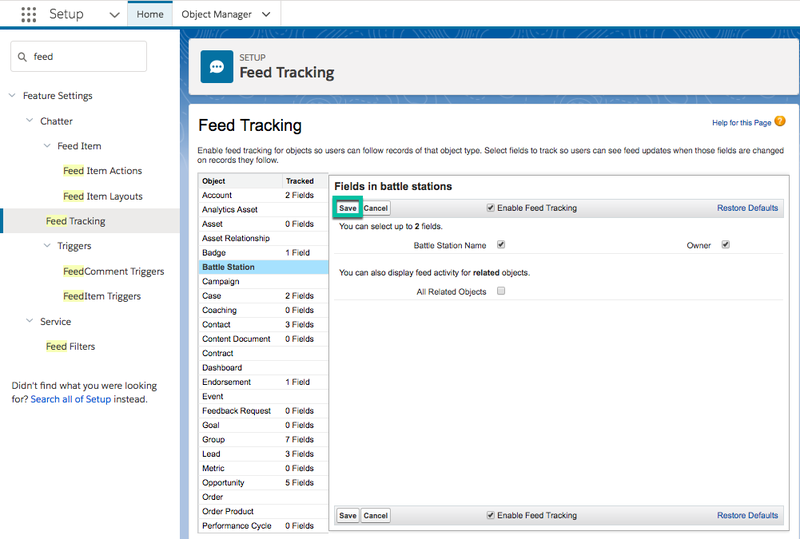 From Setup, enter Feed in the Quick Find and select Feed Tracking. Click on Battle Station, and check the Enable Feed Tracking checkbox. Check the Battle Station Name and Owner checkboxes. Click Save. Click New Lightning App. Enter Battle Station Construction as the App Name, then click Next. From Available Items, select Battle Stations, Reports, and Dashboards and move them to Selected Items. Click Next. To verify your changes, click the App Launcher and select the Battle Station Construction app.